Propane is heavier then air and will "pool" on the ground and lay there unnoticed until a spark ignites it! Use caution when working with propane. Propane is under high pressure, make sure all hoses and fittings are rated for propane use, properly tightened and sealed, and checked with soapy water. Check all connections with soapy water for leaks before lighting anything. WHEN IN DOUBT TURN OFF THE GAS AT THE TANK! WHEN LIGHTING A FORGE, FIRE FIRST, THEN TURN ON THE GAS. IF IT DOESN'T LIGHT TURN OFF THE GAS. ***NEVER TURN ON THE GAS, THEN PUT THE MATCH TO IT - THIS MAY A GAS BUILDUP AND AN EXPLOSION. NEVER LEAVE THE GAS RUNNING IF THE BURNER IS NOT LIT. ****Do not over tighten - a gentle tightening with the wrench is sufficient. Too tight will ruin the brass seat. ***This is a reverse thread - it tightens in the opposite direction. 4) Turn on the valve on the propane tank. The Regulator is now attached to the tank. 1) With the regulator attached and the regulator knob loose (fig. 3), open the valve on the tank. ***If you hear hissing of gas or smell propane, close the valve on the propane tank immediately...there is a leak or the valve at the burner is not closed. B) TURN OFF THE PROPANE TORCH. C) Wait until the propane is cleared out of the furnace - 1 or 2 minutes. You can then try again. Safety Equipment: When casting bronze wear proper safety equipment. 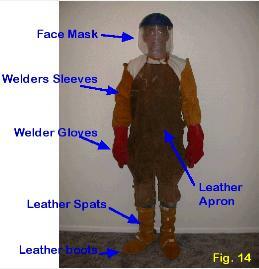 Clothes should be cotton (not synthetics which melt to your skin when burning), leather boots, apron, gloves, welders spats, sleeves and face mask. I purchased much of this at Harbor Freight for very reasonable prices: Gloves under $10 (for 3 pair), welders spats and sleeves for $10. I think they also have aprons. If you want better quality welding leathers, go to a welding store. A whole outfit will cost under $75. Open the furnace (wearing the proper safety equipment) and proceed with your pour. 1) Go to B. Lighting the Furnace, and start at #2. ***WARNING: if the furnace is hot, the gas could ignite in the furnace causing a ball of flame to puff out of the furnace and it may ignite for a moment. This is common, but keep face, hands and flamable objects away from the furnace mouth.